The Temperature in the cave is constant (+11degreese �) and does not depend on fluctuations of temperature on a surface. Humidity - 100 %. Photo: "The growhtes" of gypsum crystals in the one of halls of Distant area. The Cave "Optimistic" is known by all cave explorers of the world, and it is no surprising - by the length of the labyrinth it is the greatest cave on continent and second-largest in the world after the American system Flint - Rich and Mammoth. The General long of all passages Optimistic cave finished mark on the map, makes 212 kms(by the data 2001) There is in the picturesque piece of Ukraine - Podolia, not far from at merginse of the rivers Dnestrs and Zbuch. 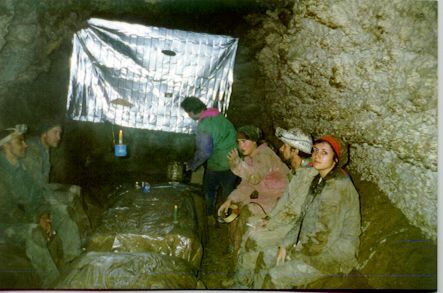 It Was discovery in 1966 by the Lvov cave explorers and on present time it is investigated by them. Everyone expedition adds to a map of the cave on 100 meters, and sometimes on 1,5 kms and more. Now the Optimistic cave consists of 13 areas which differ from each other morphology of passages, color and structure of gypsum, quantity of crystals, their sizes, form, shade. The areas are relatively isolated, connect between among themselves one or two courses. Begins this bigest and the most interesting cave with unattractive area. Corridors here is small, rather various. The walls are grey, more often smeared by gypsum. The area is named Old or Entrance. It is long 9,9kms. In the east, through 200 meters low and narrow manhole it is connected with the cave "Windy". In the west the Entrance area adjoins with the "Globes" area. Here appearance the wide galleries well worked by water - "Cyclops", "Cave explorers", "Eternally young", "Sofia"; halls - "Friendship", 'Anniversary". Often you can see the grottoes, formed by crushing huge gypsum blocks. The surface of take-off often has the spherical form, whence the name of the "Globes" area. It has added to a map of the Cave 10,6kms. On north the area of "Globes" connect wiht the " Fresh water" area. When this area have discovery in the majority of passages there was a water, as has denominated the area. In area "Globes" in gallery "Cyclops" was equipped in the first of the history of the cave underground base camp. But at that time in the cave water was not found yet, and water should be carried in canisters from a surface. In a southwest the "Globes" area through single passage connect with "New" area. Else it is name is "Central". This is a largest area. It is long its labyrinth makes 48,3 kms. In the western part of this area for the first time is found a water, that has allowed to put there undergraund camp, which operates before present day. In the central and southern part of this area almost the richest grid of passages in the whole cave . The narrow corridors often broadened in the bottom third, sometimes form the spacious galleries abounding with crystals - "Road Chumatski" , "the Prospectus of Shevchenko", "Krakow" etc. On crossing of different passages in result collapse large grottoes and the halls which have been blocked up with the big blocks were formed. In this part of the cave noted two- or even three-tier construction. The first floor - "cellars" - most is develop in the central and southern parts of area. These are wide and low passages with sloping ceiling. Above the first floor, practically on whole labyrinth the second floor is located. These are high, narrow corridors, Gothic type. Walls in "New" area mainly dark, places strewn blinding white, sparkling crystals. 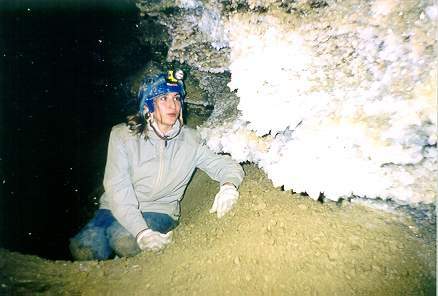 You can see also, hanging down from a ceiling, yellow - pink transparent crystals layer the gypsum, reaching sometimes one meter in section . To the west from "New" area the "Distant" area lasts in a northwest direction. Its general long is 22,151 kms. The walls is basically white here, places is strewn completely transparent crystals. In "Distant" area are located such huge gallery, as "Aspirant" - 180 m long at width of 15 m, "Sparkling" - long 190 m, "Lvov - 80 m. There are plenty of down up stone. To move it is necessary jumping with a stone on a stone, climbing on rocks, clambering in the narrow and deep corrydors. Tired after the moved, passing last blockage suddenly get in the straight linees, equal corridors where it is possible to go in full growth, not looking under the legs. Walls golden-yellow, sometimes white, with freakish patterns. It is the "Lake" area. There is a huge hall with a blockage on northern perimeter. Having gone down on a blockage downwards suddenly you can see under the legs the reflected light of lanterns - water, and not simply a passage with water, but the really lake leaving under a wall. Passing by the border of a blockage, having squeezeed between blocks it is possible to see the second, and the third lake is farther also. A hall have named "Akva-Vita", and the area - "Lake". The most interesting, that the water level in lakes from the date of discovery the Optimistic cave never varied, while in other areas Optimistic and in the cave located near to it "lue Lakes" it is changes with amplitude up to 2 meters. Extraordinary beauty in "Lake" area is galleries of "Twelve Apostles", "Honolulu", "Pamiro-Altay"; "Grigory Skovorody's" hall. The crystals in this area is not so large, but there are a lot of them and the form are whimsical - on walls of a needle, hedgehogs, and a floor strew that is like a snow. The most beautiful area considers "Zaozernyj" ("Beyond Lake")area. To get there it is possible by overcome through a blockage in "Akva-vita" hall. Grandiose emptiness, a coloring of walls and ceiling - strips light, dark, red, yellow, some circles, zigzags. And crystals - from fine, like at hoarfrost, up to huge, size about a bottle from under Champagne, absolutely transparent. To see this museum of a nature is the deserved reward that who was not frightened of difficulties, and has overcome almost five-kilometer way, where to have to go on bending leg, or simply having bent, or jumping from rock on rock, climbing up rocks, clambering in narrows coridors. There are equipped underground camp, where you can have a rest, drink the cap of hot tea to have a snack, that is facilitates the way . For lasting many days travel in the cave Optimistic underground camp supply with a stock of products, kerosene stoves, there are all conditions for a spending for the night, cooking of high-grade hot food. Skilled cave explorers who have devoted the most part of life to research Optimistic will provide safety of the travel, necessary comforts on the rest, will help to overcome difficulties of movement in the cave, will make travel by an interesting and fascinating, kept in mind adventure.